Boxmoor School in Hertfordshire has recently been assessed for and achieved the national Award for inclusion. Boxmoor is a popular one-form-entry primary school offering an inclusive education to the children of families living nearby. The local area is not generally considered to be diverse in terms of cultural identity, home language or faith and there are only low proportions of children with special educational needs or disabilities, or who are eligible for ‘pupil premium funding’ because of disadvantage. Nevertheless, Boxmoor children represent the full range of learning or social ‘difference’, and in addition some experience medical or sensory problems and a number have been identified as having specific talents or areas of interest. Boxmoor professionals consider that whether children have easily identifiable differences or not, all are unique and have needs that need to be catered for individually. The report of the most recent Ofsted inspection of the school (April 2015) states that: ‘The small number of disabled pupils and those who have special educational needs make similarly good progress as others. This is because the school focuses resources sharply on individual needs and adapts programmes of support quickly if evaluation shows they are not having sufficient impact. The most able pupils make good progress’. Recent pupil outcomes documented within the body of the 2017 IQM assessment report indicate that this situation has changed very little. In some specific areas, the Boxmoor professionals already have planning in place that they feel will impact positively on the success of individuals. The original Boxmoor Primary School building was constructed during the 1970s and it was extended and refurbished about ten years ago. Every area is neat and clean with a welcoming atmosphere, from the entrance hall with its comfortable sofa, to the interestingly-shaped classrooms and outdoor learning areas including a ‘forest school’. Useful educational technology includes desktop computers and interactive whiteboards in all classrooms and small group teaching spaces, also a generous allocation of iPads loaded with child-friendly software. In addition, there are the more traditional banks of teaching resources, library stocks, sports equipment etc, all renewed as necessary and on an ongoing basis. 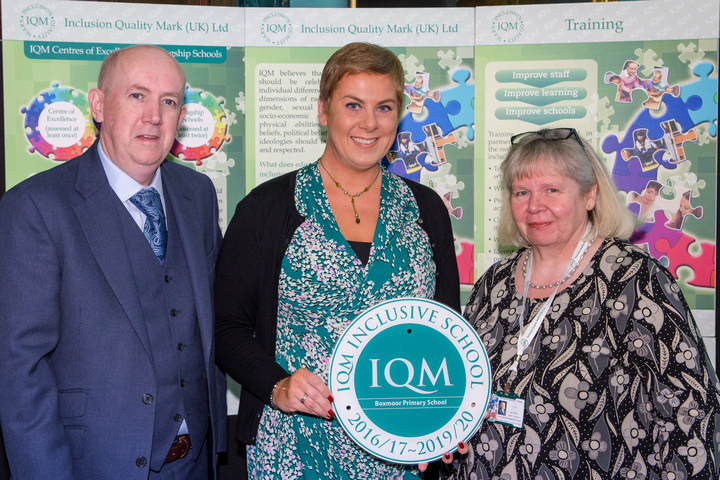 During the day of the 2017 IQM assessment I was accompanied on learning walks and observed children from all parts of the school in both formal and informal environments, working and playing with friends, cheerful and confident, some supported by empathetic professionals. I spoke to a number of children who impressed me with the level of their understanding of what they were studying, including one very enthusiastic four-year-old in the nursery class, who when I admired her drawing of a butterfly, invited me to look at a cocoon hanging from the lid of a jam-jar but seriously instructed me not to wobble it as the ‘cocoon might fall off and break’. Thank you also to the deputy chair of the governing body, the governor with special educational needs and disabilities as her focus area. The deputy chair came to take part in the IQM assessment and it was really encouraging to meet someone who was so understanding of the issues facing the inclusive school of today, it was clear that the challenge to search for answers to questions of how to support the academic inclusion of all Boxmoor children really does come from the top. As always, I am grateful to everyone I met during my assessment day and especially to the head teacher, Vicky Campos, and the SENCo, Emma Argiolas, who act as joint IQM coordinators, and who planned and coordinated my visit so that I could see everything I needed to see. It is impossible to include a comment about every area observed and every intervention discussed, but I hope that all the children, parents and professionals I met during my visit will understand that each of them contributed to a very positive IQM assessment.